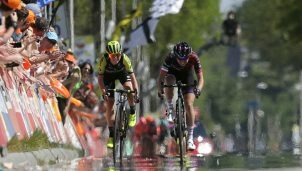 Después del primer día con doble sector, la balear Mavi García es la mejor colocada de la Selección española en el Tour d’Ardèche femenino (2.1). García ha conseguido entrar sin ceder ni un sólo segundo en las dos partes de la etapa, por lo que se mantiene con las opciones intactas para la general antes de que empiece la montaña. La mallorquina logró esta mañana un 19º puesto en meta, por un 26º de la sesión vespertina, ambas resueltas al sprint pero con cortes en el pelotón. Por lo demás, Eider Merino es la siguiente clasificada (43ª) en la general después de haberse dejado unos segundos esta mañana. 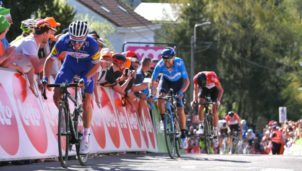 Arlenis Sierra (Astana) ha ganado la etapa de esta tarde y se coloca, por puestómetro, líder de la carrera por delante de la norteamericana Alexis Ryan (Canyon SRAM), que ganó el sector matinal. 2 RYAN Alexis Canyon SRAM Racing m.t. 3 ANDERSEN Susanne Norway m.t. 4 JACKSON Alison Team TIBCO – SVB m.t. 5 HANNES Kaat Belgium m.t. 6 WINDER Ruth United States m.t. 7 MAINE Katherine Rally Cycling m.t. 8 SHEKEL Olga Ukraine m.t. 10 BORGLI Stine Anderson Norway m.t. 11 VAN WITZENBURG Marieke Health Mate – Cyclelive Team m.t. 12 BERGEN Sara Rally Cycling m.t. 13 IVANIUK Maryna Ukraine m.t. 14 PIRRONE Elena Astana Womens Team m.t. 15 GILLOW Shara FDJ Nouvelle Aquitaine Futuroscope m.t. 16 NIEWIADOMA Katarzyna Canyon SRAM Racing m.t. 17 HAMMES Kathrin Germany m.t. 18 BUURMAN Eva Netherlands m.t. 19 RICHIOUD Greta FDJ Nouvelle Aquitaine Futuroscope m.t. 20 ZANNER Beate Germany m.t. 21 DE VUYST Sofie Belgium m.t. 22 RAGUSA Katia Bepink m.t. 23 HARVEY Mikayla Team Illuminate m.t. 24 VAN DEN STEEN Kelly Belgium m.t. 25 KERN Spela Health Mate – Cyclelive Team m.t. 26 GARCIA Margarita Victoria Spain m.t. 27 MERINO Eider Spain m.t. 28 NEUMANOVÁ Tereza Team Dukla Praha Women m.t. 29 CROMWELL Tiffany Canyon SRAM Racing m.t. 30 AALERUD Katrine Norway m.t. 31 MEDVEDOVA Tereza Bepink m.t. 32 RIJKES Sarah Experza-Footlogix m.t. 33 DREVILLE Anabelle Team Credit Mutuel Mix m.t. 34 CHAPMAN Brodie Team TIBCO – SVB m.t. 35 BRAVARD Charlotte FDJ Nouvelle Aquitaine Futuroscope m.t. 36 NILSSON Hanna BTC City Ljubljana m.t. 37 GUDERZO Tatiana Bepink m.t. 38 COBB Alice Team TIBCO – SVB m.t. 39 CAMPBELL Teniel UCI WCC Womens team m.t. 40 PATIÑO Paula UCI WCC Womens team m.t. 41 GRUBER-STADLER Hannah Austria m.t. 42 MUZIC Évita FDJ Nouvelle Aquitaine Futuroscope m.t. 43 MARTINEZ Cristina Spain m.t. 44 HALL Katie United States m.t. 45 THOMAS Leah United States m.t. 46 MORENO Blanca Liliana Astana Womens Team m.t. 47 SEMIONOVA Iryna Ukraine m.t. 48 ENSING Janneke Netherlands m.t. 49 MICKEY Abigail Rally Cycling m.t. 50 MAGNALDI Erica Bepink m.t. 51 FRANZ Heidi Rally Cycling m.t. 52 SHAPIRA Omer Israel m.t. 53 ANDERSON Grace Team Illuminate m.t. 54 KONONENKO Valeriya Ukraine m.t. 55 VAN DER LUGT Marlies SwaboLadies.nl m.t. 56 NUÑO Aida Spain m.t. 57 BUYSMAN Nina Netherlands m.t. 58 POTOKINA Anna Servetto – Stradalli Cycle – Alurecycling m.t. 59 SICOT Marion Team Credit Mutuel Mix m.t. 60 POIDEVIN Sara Rally Cycling m.t. 61 BESSONE Marion Servetto – Stradalli Cycle – Alurecycling m.t. 62 DEMEY Valerie Belgium m.t. 63 VAN DE VELDE Julie Belgium m.t. 64 LLAMAS Lorena Spain m.t. 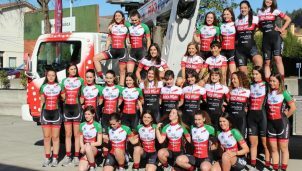 65 GEBRU Eyeru Tesfoam UCI WCC Womens team m.t. 66 MICHIELS Githa Belgium m.t. 67 SHARGA Olena Ukraine m.t. 68 MACHACOVA Jarmila Team Dukla Praha Women m.t. 69 VAN VEEN Esther Netherlands m.t. 70 DOBRYNINA Kseniya Servetto – Stradalli Cycle – Alurecycling m.t. 71 NEWSOM Emily Team TIBCO – SVB m.t. 72 WILES Tayler United States m.t. 73 VAN NECK Melissa Team Dukla Praha Women m.t. 74 RIABCHENKO Tetyana Ukraine m.t. 75 SCHIFF Carolin Germany m.t. 76 RITTER Martina Austria m.t. 77 KORMOS Veronika Anna Health Mate – Cyclelive Team m.t. 78 VALSECCHI Silvia Bepink m.t. 79 GROSSETETE Maelle FDJ Nouvelle Aquitaine Futuroscope m.t. 80 OLSSON Sara YRDP P/b Fred Whitton Challenge m.t. 81 BAKS Marissa SwaboLadies.nl m.t. 82 FERON Senna YRDP P/b Fred Whitton Challenge m.t. 83 TAZREITER Angelika Austria m.t. 84 ALBRECHT Lex Team TIBCO – SVB m.t. 85 GUILMAN Victorie FDJ Nouvelle Aquitaine Futuroscope m.t. 86 KIRILLOVA Polina Russia m.t. 87 JENAL Annina Austria m.t. 88 PINTAR Urša BTC City Ljubljana m.t. 89 TRAXLER Anna Gabrielle YRDP P/b Fred Whitton Challenge m.t. 90 ESPÍNOLA Agua Marina UCI WCC Womens team m.t. 91 CHERNYSHOVA Galina Russia m.t. 92 LORVIK Ingrid Norway m.t. 93 KASHIKI Shoko Team Illuminate m.t. 94 YAPURA Fernanda UCI WCC Womens team m.t. 95 CASASOLA Sara Servetto – Stradalli Cycle – Alurecycling m.t. 96 ZIGART Urska BTC City Ljubljana m.t. 97 ELLSAY Gillian Rally Cycling m.t. 98 GEHNBÖCK Sylvia Austria m.t. 101 BUSS Kathryn Team TIBCO – SVB m.t. 104 FISHMAN Roni Israel m.t. 105 KRYLOVA Seda Russia m.t. 108 ENEVER Sophie YRDP P/b Fred Whitton Challenge m.t. 109 GEZ Avital Israel m.t. 110 DRUYTS Jessy Experza-Footlogix m.t. 111 BAR-ON Miriam Israel m.t. 112 WALLACH Gali Israel m.t. 113 HEINE Vita Norway m.t. 114 SZABO Zsofia Health Mate – Cyclelive Team m.t. 115 DEFOUR Lara Health Mate – Cyclelive Team m.t. 116 CETKOVSKA Ema Team Dukla Praha Women m.t. 117 COLE Janelle United States m.t. 118 LILLY Kara YRDP P/b Fred Whitton Challenge m.t. 119 MILLARD Lexie Team Illuminate m.t. 120 SCHULZ Tina Germany m.t. 121 DEBESAY Mossana Servetto – Stradalli Cycle – Alurecycling m.t. 122 SCHWEINBERGER Kathrin Health Mate – Cyclelive Team m.t. 123 BAJGEROVÁ Nikola Team Dukla Praha Women m.t. 124 ERATH Tanja Canyon SRAM Racing m.t. 125 LUCA Eva Germany m.t. 126 NGUYEN Thi That UCI WCC Womens team m.t. 127 DIETRICH Jacqueline Germany m.t. 128 BIRKENES Karina Norway m.t. 129 DE GAST Belle Netherlands m.t. 130 MEKHTIEVA Gyunel Russia m.t. 131 ELSNER Tanja BTC City Ljubljana m.t. 132 STAELENS Bérengère Team Credit Mutuel Mix m.t. 135 RADOTIC Mia BTC City Ljubljana m.t. 136 KORVASOVA Tereza Team Dukla Praha Women m.t. 139 NUÑO Nerea Spain m.t. 140 DE GRAAFF Femke SwaboLadies.nl m.t. 5 WINDER Ruth United States m.t. 6 VOLLERING Demi SwaboLadies.nl m.t. 7 SHEKEL Olga Ukraine m.t. 8 BUURMAN Eva Netherlands m.t. 9 NIEWIADOMA Katarzyna Canyon SRAM Racing m.t. 10 RAGUSA Katia Bepink m.t. 11 RICHIOUD Greta FDJ Nouvelle Aquitaine Futuroscope m.t. 12 BORGLI Stine Anderson Norway m.t. 13 BERGEN Sara Rally Cycling m.t. 15 CROMWELL Tiffany Canyon SRAM Racing m.t. 16 GILLOW Shara FDJ Nouvelle Aquitaine Futuroscope m.t. 17 HARVEY Mikayla Team Illuminate m.t. 18 GARCIA Margarita Victoria Spain m.t. 19 ENSING Janneke Netherlands m.t. 20 DOBRYNINA Kseniya Servetto – Stradalli Cycle – Alurecycling m.t. 21 VAN DE VELDE Julie Belgium m.t. 23 GEHNBÖCK Sylvia Austria m.t. 24 ELLSAY Gillian Rally Cycling m.t. 25 KASHIKI Shoko Team Illuminate m.t. 26 ESPÍNOLA Agua Marina UCI WCC Womens team m.t. 27 LORVIK Ingrid Norway m.t. 28 YAPURA Fernanda UCI WCC Womens team m.t. 30 IVANIUK Maryna Ukraine m.t. 31 ZANNER Beate Germany m.t. 32 VAN WITZENBURG Marieke Health Mate – Cyclelive Team m.t. 33 NEUMANOVÁ Tereza Team Dukla Praha Women m.t. 34 RIJKES Sarah Experza-Footlogix m.t. 35 MEDVEDOVA Tereza Bepink m.t. 36 BRAVARD Charlotte FDJ Nouvelle Aquitaine Futuroscope m.t. 37 AALERUD Katrine Norway m.t. 38 CHAPMAN Brodie Team TIBCO – SVB m.t. 39 VAN DEN STEEN Kelly Belgium m.t. 40 GRUBER-STADLER Hannah Austria m.t. 41 COBB Alice Team TIBCO – SVB m.t. 42 FRANZ Heidi Rally Cycling m.t. 43 MERINO Eider Spain m.t. 44 GUDERZO Tatiana Bepink m.t. 45 KERN Spela Health Mate – Cyclelive Team m.t. 46 MICKEY Abigail Rally Cycling m.t. 47 DREVILLE Anabelle Team Credit Mutuel Mix m.t. 48 CAMPBELL Teniel UCI WCC Womens team m.t. 49 THOMAS Leah United States m.t. 50 HANNES Kaat Belgium m.t. 51 DE VUYST Sofie Belgium m.t. 52 NILSSON Hanna BTC City Ljubljana m.t. 53 MORENO Blanca Liliana Astana Womens Team m.t. 54 NEWSOM Emily Team TIBCO – SVB m.t. 55 PATIÑO Paula UCI WCC Womens team m.t. 56 HALL Katie United States m.t. 57 BESSONE Marion Servetto – Stradalli Cycle – Alurecycling m.t. 58 VAN NECK Melissa Team Dukla Praha Women m.t. 59 HAMMES Kathrin Germany m.t. 60 MUZIC Évita FDJ Nouvelle Aquitaine Futuroscope m.t. 61 BUYSMAN Nina Netherlands m.t. 62 SHAPIRA Omer Israel m.t. 63 POIDEVIN Sara Rally Cycling m.t. 64 MAGNALDI Erica Bepink m.t. 65 POTOKINA Anna Servetto – Stradalli Cycle – Alurecycling m.t. 66 KONONENKO Valeriya Ukraine m.t. 67 MARTINEZ Cristina Spain m.t. 68 GROSSETETE Maelle FDJ Nouvelle Aquitaine Futuroscope m.t. 69 DEMEY Valerie Belgium m.t. 70 GEBRU Eyeru Tesfoam UCI WCC Womens team m.t. 71 VALSECCHI Silvia Bepink m.t. 72 SEMIONOVA Iryna Ukraine m.t. 73 VAN DER LUGT Marlies SwaboLadies.nl m.t. 74 NUÑO Aida Spain m.t. 75 GUILMAN Victorie FDJ Nouvelle Aquitaine Futuroscope m.t. 76 VAN VEEN Esther Netherlands m.t. 77 MICHIELS Githa Belgium m.t. 78 LLAMAS Lorena Spain m.t. 79 FERON Senna YRDP P/b Fred Whitton Challenge m.t. 80 KIRILLOVA Polina Russia m.t. 81 SICOT Marion Team Credit Mutuel Mix m.t. 82 ANDERSON Grace Team Illuminate m.t. 83 MACHACOVA Jarmila Team Dukla Praha Women m.t. 84 SHARGA Olena Ukraine m.t. 85 BAKS Marissa SwaboLadies.nl m.t. 86 SCHIFF Carolin Germany m.t. 87 PINTAR Urša BTC City Ljubljana m.t. 88 WILES Tayler United States m.t. 89 RIABCHENKO Tetyana Ukraine m.t. 90 RITTER Martina Austria m.t. 91 ALBRECHT Lex Team TIBCO – SVB m.t. 92 TAZREITER Angelika Austria m.t. 93 TRAXLER Anna Gabrielle YRDP P/b Fred Whitton Challenge m.t. 96 JENAL Annina Austria m.t. 99 ZIGART Urska BTC City Ljubljana m.t. 108 MEKHTIEVA Gyunel Russia m.t. 110 DE GAST Belle Netherlands m.t. 111 SCHWEINBERGER Kathrin Health Mate – Cyclelive Team m.t. 112 BAJGEROVÁ Nikola Team Dukla Praha Women m.t. 113 COLE Janelle United States m.t. 114 MILLARD Lexie Team Illuminate m.t. 115 SAIFUTDINOVA Natalya Astana Womens Team m.t. 116 DEFOUR Lara Health Mate – Cyclelive Team m.t. 117 HEINE Vita Norway m.t. 118 SZABO Zsofia Health Mate – Cyclelive Team m.t. 119 WALLACH Gali Israel m.t. 120 ENEVER Sophie YRDP P/b Fred Whitton Challenge m.t. 121 BAR-ON Miriam Israel m.t. 122 ERATH Tanja Canyon SRAM Racing m.t. 123 DIETRICH Jacqueline Germany m.t. 125 SCHULZ Tina Germany m.t. 126 DEBESAY Mossana Servetto – Stradalli Cycle – Alurecycling m.t. 127 ELSNER Tanja BTC City Ljubljana m.t. 130 LILLY Kara YRDP P/b Fred Whitton Challenge m.t. 131 LUCA Eva Germany m.t. 136 CLYNE Margot United States m.t.